Good morning! Are ya ready for some blog hoppin'? I sure hope so, because we've got some wonderful things to share with you for this hop celebrating the Peachy Keen Stamps Fall mini release and the Country Bumpkin Stamps release. If you arrived here from my sweet friend Viv's Blog, then you're hopping along in perfect order, but if you just happened along, then you definitely want to go back to the beginning to the Peachy Keen Stamps Blog, and check out all the wonderful creations from there. Each design team member is giving away a $15.00 gift certificate! How cool is that? If I counted right, that's about 15 chances to win, so hopping could get you a pretty sweet deal, if you're one of the lucky winners!! For this card, I used the Tanner Turkey Country Bumpkin stamp. I stamped Tanner Turkey with Memento Tuxedo Black in onto white card stock, and colored him with Copic markers. The patterned paper is all from Daisy D's, and the only embellishments are the buttons. I played along with the Deconstructed Sketch Challenge for this card. I do love those sketches!!! Your next stop on this happy hop will be at the sweet and talented Janice's Blog Enjoy the hop, and good luck you ya! Just in case you happen to get lost along the way, below you will find a complete list of all the artists participating in this hop. Don't forget that you have many, many chances to win, just by dropping by the above listed blogs and leaving a comment. There's also some more good news!!!!! 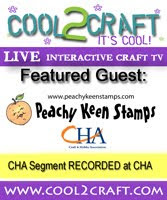 In celebration of this three day blog hop, Peachy Keen Stamps is going to give you an extra 10 percent discount. Just use the couplon code MINIHOP, when checking out with your merchandise. Thank you so much for hopping by today!! I hope you're enjoying a beautiful day and of course some happy stamping! This is awesome!! I LOVE your coloring!! Amazing! Lorie, your card is FANTASTIC!! I love the way you colored up the body of Tanner Turkey, and then, of course your coloring all around is perfection! You totally rocked this sketch, Girlie! What a fun hop and thanks for playing with us at DSC too! WOW, that is awesome. I do not copic but you are awesome at it. TFS. I just love little Tanner Turkey! He's so cute! I think the colors you used a so beautiful and festive together!! I love this Turkey you did an awesome job coloring him and putting this card together. awesome turkey card. love the papers! !, New follower here. I love this new release! Lorie, you are so talented! Your card is awesome as always! Great card. What a cute turkey! Sooo cute!!! The colors are perfect!!! That is a cute turkey, great card! Thanks for sharing! I love this turkey and how you used it on your card. wow, great stamp release. love your card, perfect turkey day card. Fun! I too love a good sketch... And, your choice of Tanner shows it off so well!! Happy Turkey Day! Great card. I like Viv's title for you "Copic Queen." I'm so glad you used the turkey to showcase because he is my favorite of the release. Love the turkey. Your Copic skills are awesome. I will have to take the plunge someday! Very cute! love your coloring! Your card is beautiful!! LOVE the turkey!! Cute, cute card. Congrats on your release. Awesome coloring on the gooble gooble!! ohhh love your coloring! Fantastic job! super cute.. the turkey is great you did an amazing job coloring him.. and i love all the colors and patterns you used on this its beautiful tfs! Really cute and fun looking turkey. I love your color choices. You've done really nice work. TFS. How cute! Who wouldn't have a smile on when they get this card? Thanks for the hop! The Turkey is so cute! I am a new follower! Love the stamps! Congrats Lorie, love your Country Bumpkin sets, especially Mr Tanner Turkey here!!! Cute, cute card!!! That turkey is too cute - great job on the coloring. I love turkeys and this guy is to cute!!! toooo cute love how you used the dots to color in the turkey very cute !!! Wow! Your stamps are adorable and your coloring is amazing. I am a new follower hoping to learn some new things :) Thanks for sharing your wonderful gifts! Your turkey card is so adorable!! I love your stamps! Congrats!! Super cute turkey card! Great stamp! Great coloring and the cutest turkey ever! That is just the cutest Turkey!! I love your classy background paper and your turkey is delicious! Adorable card! Love the turkey! Wow love the turkey and you really know how to work the Copics...TFS!! Your card is so cute Lorie. Awesome coloring. Tanner Turkey is just so adorable. Tanner Turkey is Sooo cute!! Very cute--great coloring on Tanner. He has got to the cutest Turkey ever! What a cute stamp and card! Very cute card and crazy turkey. Thanks. This turkey is sooo ADORABLE! Great coloring! Soooo cute! Love that turkey! nice coloring. TFS! Tom Turkey looks great! I love the coloring! Thank you! Really cute turkey, Love your card. Ginger Wreath and a WINNER!!! Lots of Peachy Keen Fun!! !